I wanted to get in a (relative… for me) long bike ride today. I took my commuter bike and loaded it up with my Kindle, my camera, notebooks and pens, plus some extra water. My idea was to ride a bit, rest and read and then ride some more. I put together a route that wound through Garland, back across town to the Pearl Cup coffeehouse, then back home. Nick is home and he rode with me east into Garland, then as we cut our way back he turned off and took the Owens Trail home. I was feeling a little off and decided I was getting overheated. It’s the first day over 90 – which soon won’t be very hot, but I haven’t acclimated to it yet – plus it’s very humid. So I hung out in a shade structure next to the athletic fields – drank some water and read a short story. Within a few minutes I felt a lot better. I enjoyed talking sports with some guys that showed up with a truck full of coolers and grills that were setting up for an all-African soccer tournament later in the day. I took off, dropped down into the Spring Creek Natural Area and then under the highway to the Canyon Creek neighborhood. The Pearl Cup has finally put a sign up and built a bike rack in front. Their mocha coffee had some nice latte art and plenty of caffeine and sugar. 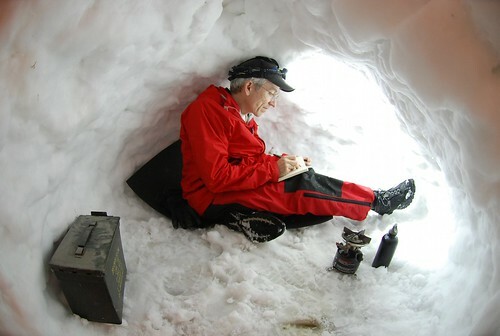 It was cool inside and I settled in with my Kindle to rest a bit. A couple nights ago I finished a novel that I had found recommended in an article about the best books of this century – The True History of the Kelly Gang, by Peter Carey. It was a very well written, interesting book… and I’m glad I read it, but it didn’t speak to me in any personal way. Now that it is finished, I’m working on a huge collection of Joyce Carol Oates stories I carry on my Kindle – eleven new ones and more than two dozen classic stories from a forty year period. It’s called High Lonesome: New and Selected Stories 1966-2006. Her writing resonates with me. As I read her harrowing, dark short fiction, my mind fills with ideas that I will have to write out. I fill pages in my Moleskine with short story ideas. Her writing shares with me the desire to explore the too-thin membrane between our illusion-filled world and the horrific void beyond. So I drank my coffee drink and a dozen glasses of iced water, read some stories, and wrote some pages. Then I took off, riding back to the thick creekbottom woods of the Spring Creek Natural Area, did a lap of the loop trail, and plopped down on a favorite bench to crank through another story. It happened to be a well-known story that I was familiar with – had read a couple times before. It was “Where Are You Going, Where Have You Been” (read it here for yourself). I hesitate to call it one of my favorite short stories… though I have to call it that – because there is no other word that fits. It is simply too disturbing to embrace fully. But it is a work of genius. I looked carefully where he was pointing, on the concrete trail right in front of where he was standing. There it was, a snake. A big snake. I stood up and we looked at it carefully (from a safe distance). “I think it’s a bullsnake,” I said. I have seen bullsnakes before. In seventh grade we had one in biology class. I have no real fear of snakes that I have seen (as opposed to snakes I haven’t seen, which scare me) so I would rush my work and play with the snake. One day I wasn’t paying close enough attention and the thing managed to slip through my collar at the back of my neck, slithering under my shirt and winding around my chest. A friend of mind jumped behind me and managed to grab the tip of its tail – then pull the thing out. Another day, I moved my hand into its aquarium cage too fast and the bull snake reared back and struck at me. It was harmless, but it scared me – I was a lot more careful after that. Today, the jogger and I watched the snake crawl through the clearing and across the trail. If I moved too close it would rear like it was going to strike and I’d jump back. 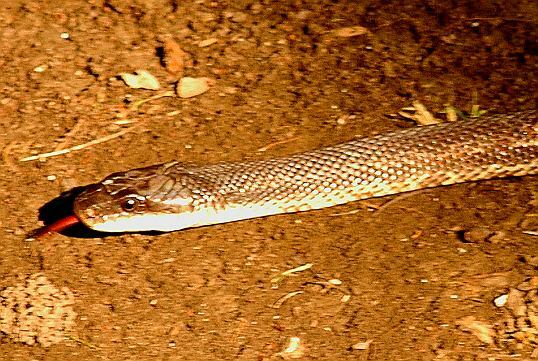 It was slender but at least six feet long – reaching pretty much across the concrete trail. The jogger finally decided to move on. I sat down and started reading again, keeping one eye on the snake as it slowly moved toward the thick woods. A family came across the bridge and saw the snake. The father, riding an expensive, fully suspended mountain bike stopped, and then went after his small son – who was on a little bike with training wheels and went straight for the snake. He had no fear. The mother followed along behind, walking a small dog. She veered way off the path, walking the dog through the thick knee-high scrub and weeds to stay far away from the snake. So she was afraid of the snake she saw, and then exposed herself to the snakes (that are undoubtedly there) that she couldn’t see. Finally the snake reached the woods and disappeared in an instant. I finished the story – somehow the presence of the snake added to the darkness and terrible foreboding of the story. The snakes are there, whether you know it or not – sometimes they come out… and remind you of what is waiting, hidden, behind the membrane of illusion. I think this is a bullsnake. I am working on trying to minimize my reliance on the automobile here in the most car-centric of cities and have wanted an independent (aka not Starbucks) Coffee shop that is a good bike ride from my house for a long time. My wish finally came true. There is an excellent place down on Henderson, The Pearl Cup, that I have frequented and enjoyed… but it is a long and difficult drive from my house (and no train station nearby). Almost a year ago they announced they were building a new location in Richardson. I began plotting a bicycle route to the place. 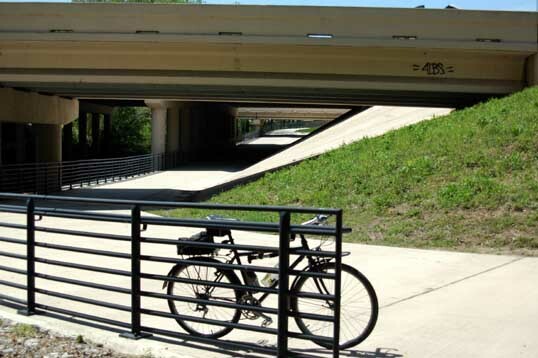 It’s on the other side of a giant highway from where I live, in a more upscale neighborhood, but I was able to find a route with a good highway crossing (underneath) and that had most of the way on trails or dedicated bike lanes, with the only remaining roads low traffic. It’s a hair under seven miles – about the perfect distance. Not too far, but fourteen miles round trip is a good workout. This weekend was a beautiful warm day, so I was able to make to ride out. 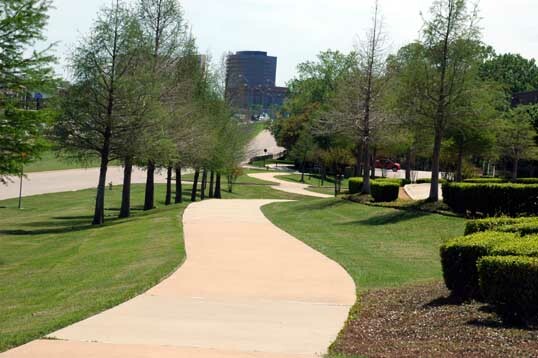 It’s a really nice route across Richardson, with some varied scenery along the way. Bike trail along the creek near my house. The first bit is down the Huffhines branch of Duck Creek on the last few yards of the Glenville trail. One of the reasons we bought our house was that they had planned and funded the trail in the creek behind us. We never thought it would take six years to get the thing finally built… but now it is. 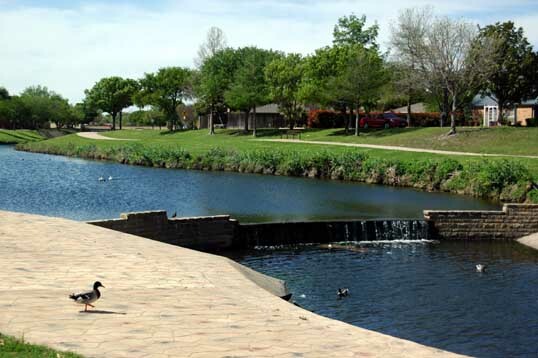 Then the route crosses the neighborhood on the Duck Creek Linear Park. Owens Bike Trail under the power lines. And then north under the powerlines on the Owens Trail. 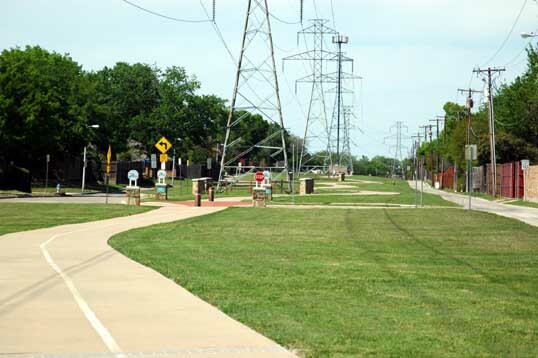 A lot of bike routes in the Metroplex are through powerline right of way. It’s not very scenic, but gets the job done. 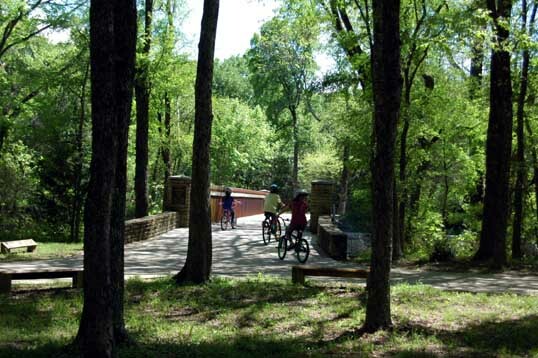 The nicest park of the ride is through the thick creekbottom woods of the Spring Creek Nature Area. Then under Highway 75 along a creek bridge. The city is working on bicycle/pedestrian crossings of the highway, with success in the northern part of the city. Up the highway on the east side, then down busy Renner road. A lot of fast cyclists use the road, but I’m slow and lazy and poke along the trail. The last little bit is down a dedicated bike lane on Custer. 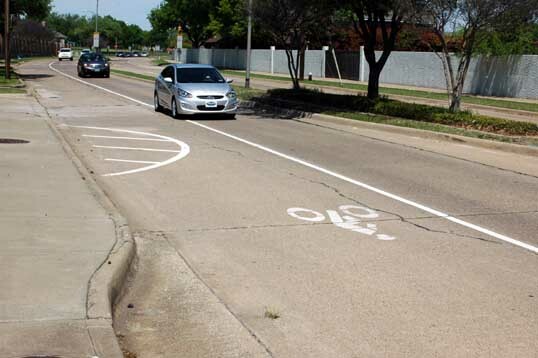 These dedicated lanes have been popular and are cropping up all over the city. The only problem is that there is often parking in these lanes which forces the bikes through the “door zone” – so riders have to go slow and careful, looking into each parked car as you go by. 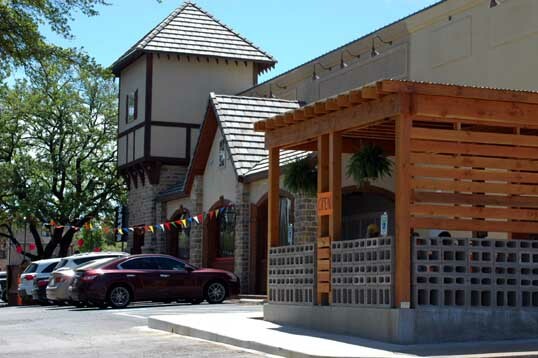 The Pearl Cup’s Outdoor Patio and Shady’s Burger Joint. And finally, the coffee shop. A great place for some Java and maybe a book or some writing. Next door they opened up a burger place, Shady’s. Candy met me there for lunch. They had a nice selection of craft beers – Dogfish Head, Devil’s Backbone, and a couple others – but no local beers. 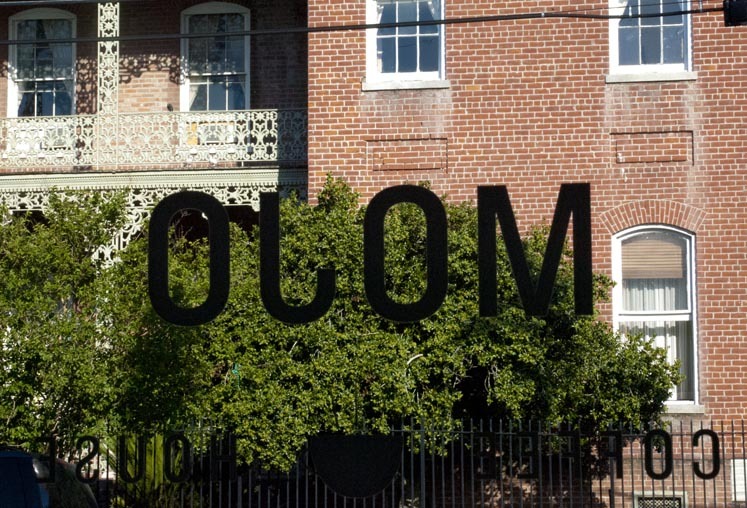 We talked to the owner and suggested he get some Deep Ellum or Lakewood on tap. So it was a nice lunch, and a nice ride – one I hope to be making a few more times. I’ve done most of this stuff – read my blog to learn about them. I love internet radio and I love local things. Internet radio from and about Denton, Texas. 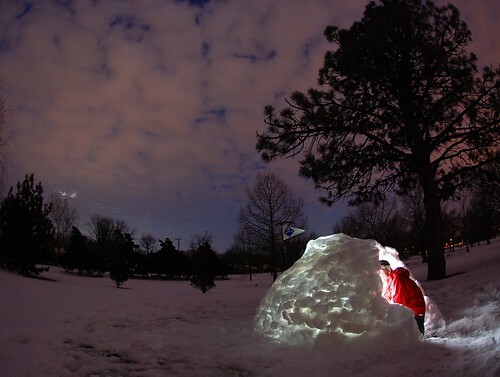 journal entry for today: 3 deg C., no wind; first igloo 0.02 km from base camp; extension cord will not reach. plan to hunt for walrus on the ice tomorrow, though few are seen here at 37deg N. latitude. 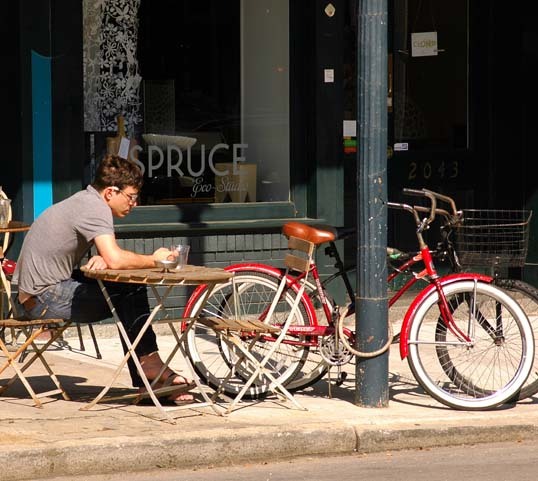 Vintage bicycles (with fenders, Brooks leather saddle, and wire baskets), a coffee shop, a sunny day, Magazine Street, New Orleans, tables on the sidewalk, nothing really much to do… it helps to get through another day in the Cube simply to know things like this do still exists. Somewhere. Somewhere else. Though I am a ridiculous old fat man on a bicycle, I have been working on increasing my mileage and exploring how to integrate cycling into my daily activities better. My goal for 2013 is three thousand miles on my bike. I knew I would start out behind (the weather in the winter is too often simply too nasty to ride) but I try to get as many miles in as possible. Saturday was a gray post-misty day, cool but not cold – usually considered depressing winter weather – but without a breath of wind, perfect for a bicycle ride. I cruised all over Richardson and North Dallas, getting in about thirty-four miles of city riding, which is a lot for me. I was pretty well worn out. Sunday was more of the same, a little warmer and a little windier and I wanted to ride somewhere and get a few more miles in – somewhere more or less useful. About eight miles away (as the bike rolls) is White Rock Coffee, one of my favorite independent coffee spots. There are a number of Starbucks within walking distance of my home, and a couple of bubble teas/smoothie emporiums, but White Rock is the closest non-national-chain coffee spot. There is a new branch of The Pearl Cup, under construction in Richardson, and when it is done it will be a nice bicycle destination. But they are still working on it – so until it’s done it’s White Rock Coffee. The problem is, I can’t find a good route to White Rock Coffee. The biggest choke point is LBJ/635 Interstate Highway loop. The best crossing between my house and the coffee place is the pedestrian bridge next to the Skillman DART station. 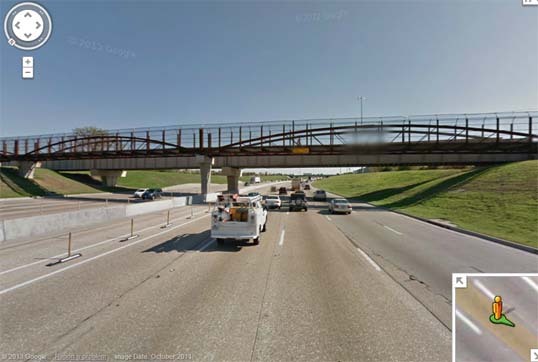 The pedestrian bridge over LBJ at the Skillman Dart station – photo from Googlemaps. Once you start looking at that crossing you realize a nefarious little bit of nasty city planning. The bridge is useful, mostly because it connects a couple of neighborhoods of rundown apartments (on either side of the freeway) with the train station and each other. The problem is that it is almost impossible to get into or out of those neighborhoods on foot or on bicycle. I don’t think this is an accident. 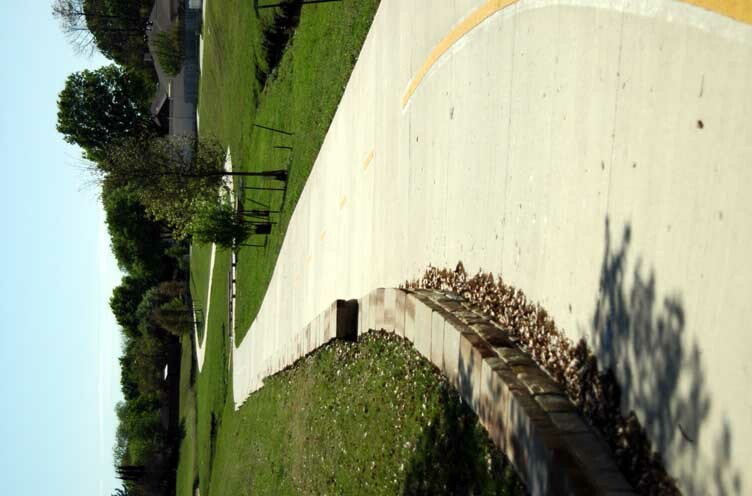 Streets running up to these areas lose their sidewalks – some residential streets are cut and blockaded. It is obvious that the powers-that-be don’t want folks walking out of their rundown apartment complexes into the more upscale areas of housing. So I have been working on finding the best route. I came up with one and it’s not that great – there are several nasty road crossings (Yale and Walnut, Leisure and Forest, and Adleta and Skillman are the some of the worst), four places where I have to walk my bike, and some heavy traffic. A long stretch of narrow, crowded residential street with parked cars filling both sides – the door zone fills the whole street. It’s especially tough because I’m riding my road bike right now – I’m rebuilding my commuter/bad weather bike. The narrow tires are pickier about terrain. I decided to give it a go today – stuffed my laptop and an extra shirt into my backpack and set off. I know eight miles isn’t very far, but it’s a tough eight miles. The backpack was heavy and I was always riding into the wind (how does that work?). It’s all crowded urban stop-and-go riding. That’s the thing about riding a bicycle in the city – you see things you never do from a car (or on foot, really, because you can’t travel that far). You see beauty, notice hills you never would otherwise, connect with the weather in an intimate, organic way… but you see a lot of nasty, brutish, and ugly stuff too. A lot of trash, homeless people, and neglect. I hadn’t anticipated the amount of broken glass on the streets and sidewalks in some of these neighborhoods. Sure enough, crossing 635 on the pedestrian bridge I put a sliver of shattered malt liquor bottle through my rear tire and had to patch it in a nasty little parking lot covered in antifreeze and oil that had been dumped there, keeping an eye on the crack dealers that were keeping an eye on me. Life in the big city in this best of all possible worlds. I had better finish this up and drink the rest of my coffee and get home – I don’t want to do that ride in the dark. I sat for a long time in the Opening Bell coffee house in Southside, writing on my laptop. Next to me was a sculpture – an assemblage of various metal parts attached to an ancient wheeled golf bag carrier. 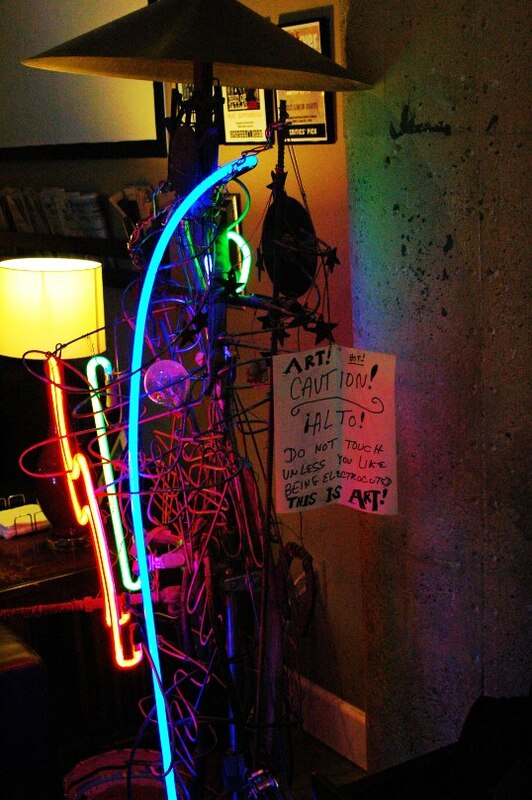 A conical brass cymbal topped it off and intertwined with the junk were multicolored neon tubes, glowing and flickering invitingly. 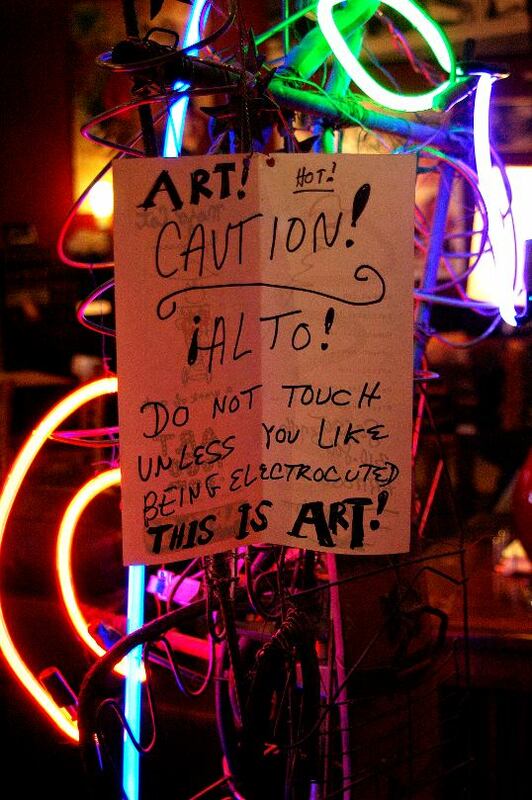 It had a great warning sign, hand-lettered and attached to the artwork. On the back of the warning sign was the title of the piece, MOJO CAT, a sketch of the work, and a link to Sasso Art To Go.